Haiti, the poorest country in the Western Hemisphere, is rich with exceptionally bright young people who serve as a beacon of hope for the future. The January 12th earthquake transformed incredible odds into even more daunting obstacles. These young persons will take on the challenge of leading the country’s transition from destruction and poverty to prosperity, with dignity. With 80% of Haiti’s population living in abject poverty, an average wage rate of $2 (U.S.) per day and an average per household annual income of $250 (U.S.); education is the most effective means to overriding economic, political, and historical barriers. Haiti is approximately 800 miles off the coast of Florida and can easily be matched to the size of Maryland (10,714 square miles) with a population of close to 9 million (8,924,553). 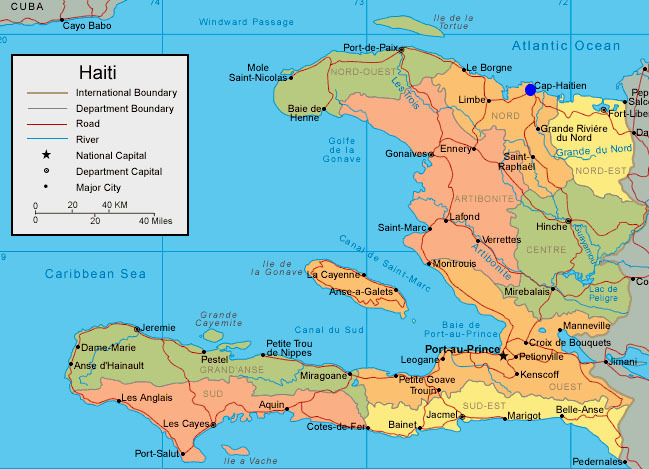 Haiti shares a border with the Dominican Republic, both of which are on the island of Hispaniola. Port-au-Prince is the capital and most populated city. The city of Cap-Haitian is the second most populated and is recognized as the birthplace of Haiti’s first King, Roi Henri Christophe – the spirit of independence reigns. Cap-Haitien is also known as home to the Citadel, a world wonder. Both French and Kreyòl are spoken in Haiti. Haiti’s history includes both triumph and tragedy. Haiti was the first post-colonial independent black-led nation in the world, yet in much of the last half-century the nation experienced considerable political instability. This has taken a toll on the economy and the standard of living in Haiti, including the education of its people. The GDP is a fairly flat 6.1 billion with 27% fueled by Agriculture. Today, close to half of the population is illiterate (48%). The enrollment rate for primary school is 67%, of which less than 30% reach the 6th grade. It is estimated that of those who make it through and complete High School, less than 1% make it to college. The return of democratic governance, enhanced corporate investment interest and an increase in focus from the world community on assisting with the sustainable strengthening o f Haiti; are all positive indicators. The key is to transform commitment into action. With Haiti’s proximity to the U.S., what impacts Haiti ultimately impacts the U.S. Together we win or together we struggle. Education is the answer to reaching a favorable and sustainable outcome.